The leaves have fallen, pumpkins are long gone and Thanksgiving is here – which can only mean one thing: it’s time to start decorating for Christmas! From classic Christmas vignettes to clever pop culture homages, we’ve got plenty of decoration tips, examples and ideas that’ll help make your cubicle the talk of the office this holiday season. It’s entirely up to you whether or not you decorate with fake or real candy, just be prepared for a lot of drop-ins by hungry coworkers if you choose the latter. You’d be surprised what a little brown or red wrapping paper, Christmas lights, cardboard and cotton can do to an old, gray cubicle. 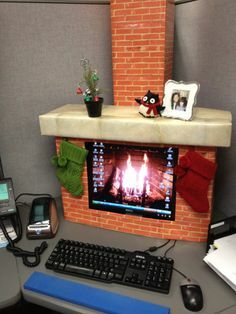 Some of our all-time favorite gingerbread house-themed cubicles include Yule log screensavers, falling snow made from threaded cotton balls and plenty of Christmas lights. 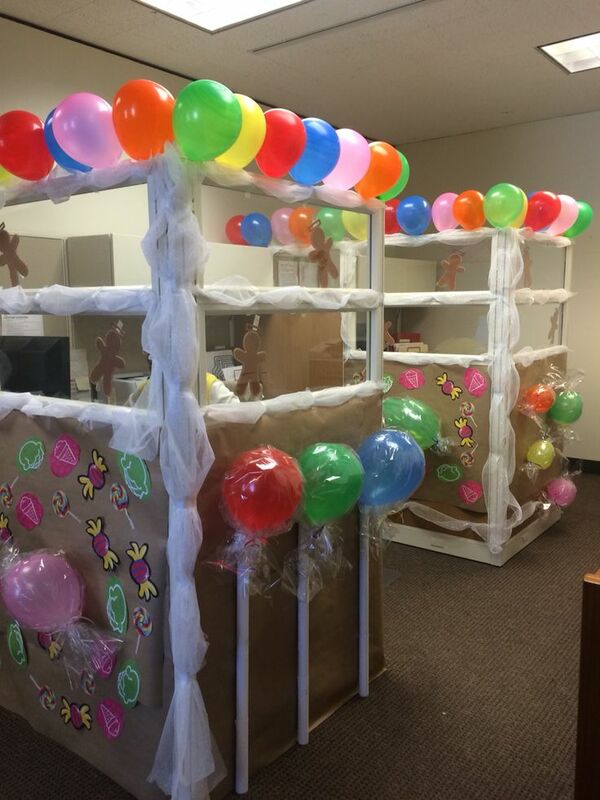 This gingerbread house cubicle gets the award for Best Use of Balloons. It’s easy to take the Charlie Brown Christmas story a bunch of different directions. You can whip up Lucy’s doctor stand with some red wrapping paper, paper towel rolls and cotton; paste cutouts of the singing characters onto a wall, complete with hanging lights; or you can just put ol’ Charlie Brown’s Christmas tree on your desk and call it a day. There’s no rule that you have to use red and green when decorating your office or cubicle for Christmas. Sometimes it’s easier to pick a color scheme and stick to it. Gold and silver works great, as does blue, white and silver. A quick and easy way to add pops of holiday color to your office is by lining the top of your cubicle walls with colored garland. One of the most unique ways to turn your office into a winter wonderland is with paper snowflakes! You can ask your coworkers to cut some out and then hang them from the ceiling, too. Just because you want to decorate your cubicle for Christmas doesn’t mean you have to blow half your paycheck on supplies and decorations. Sometimes the best Christmas decorations are made out of things you’ve got laying around the office already. It’s amazing what can be done with some paper cups and garland. Save up the old paper towel tubes and wrap them in red and white ribbon (or just use Sharpies) to turn them into candy canes, or if your job allows access to larger sized cardboard tubes you can turn your cubicle into a log cabin! 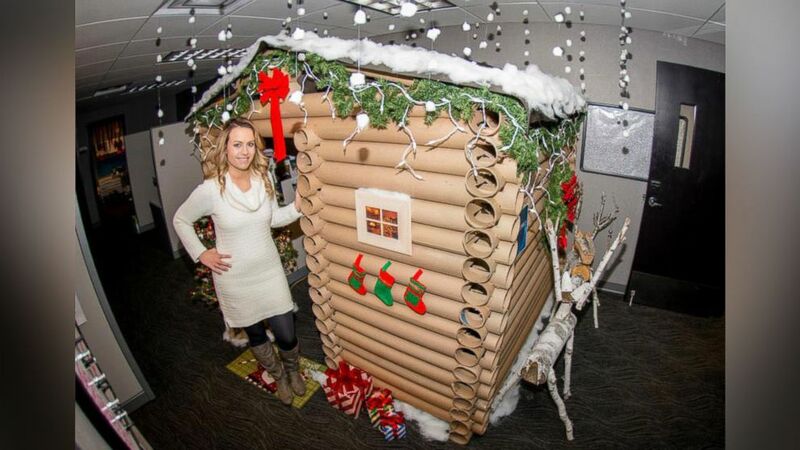 This cubicle-turned-log-cabin gets the award for Most Creative Use of Cardboard Tubes. When it comes to decorations, the more the merrier! This is your chance to get everyone in the office involved, regardless of religion. 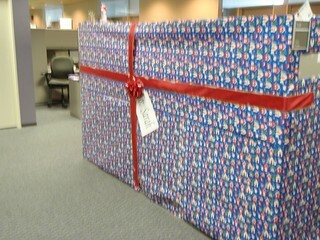 If you have some humbugs in the office you can just decorate a group of cubicles or single door. Or, you can turn it into a teambuilding exercise and have a Christmas decorating contest. When it comes to decorating en masse, more is more. Be sure to include giant lighted candy canes, tons of fluffy snow and copious amounts of lights. 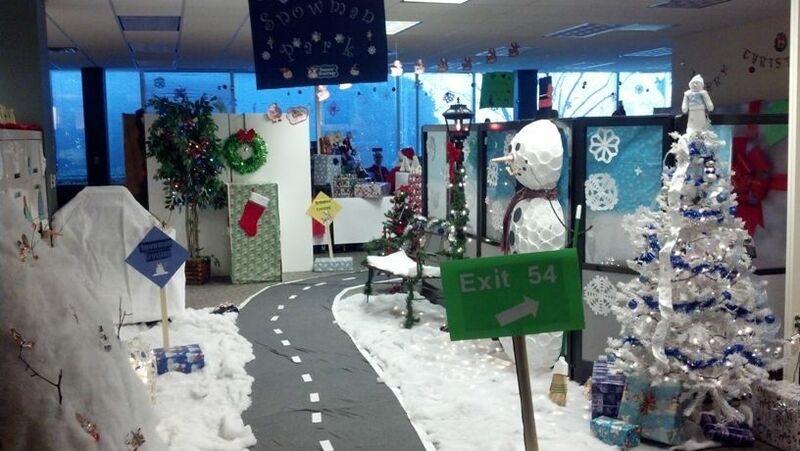 We love what happened when the entire group at this office banded together to create Snowman Park. Sometimes the simplest decorations are the best. Like taking wrapping paper and ribbons and turning everything into a present. 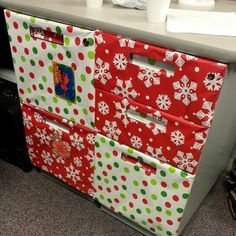 You can wrap the fronts of your filing cabinet drawers in wrapping paper for a functional decoration, you can plaster the outer walls of your cubicle in wrapping paper, complete with a ribbon and tag from Santa, or you can just take a long vacation and maybe your coworkers will wrap your entire desk, cubicle and chair for you like they did to this guy. 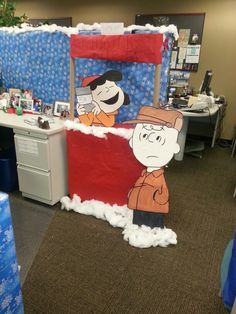 Hopefully you have plenty of ideas to decorate your cubicle with this Christmas season. We’re always looking for new ideas; so if you already decorated and want to show off, share your photos with us! We may even include them in an upcoming post. If you’re interested in learning more about our vast inventory of cubicles, request a quote and talk with our team today.